More than 100 children attended the Fiji Rugby Union coaching clinic for children at the Bidesi Park in Suva yesterday. 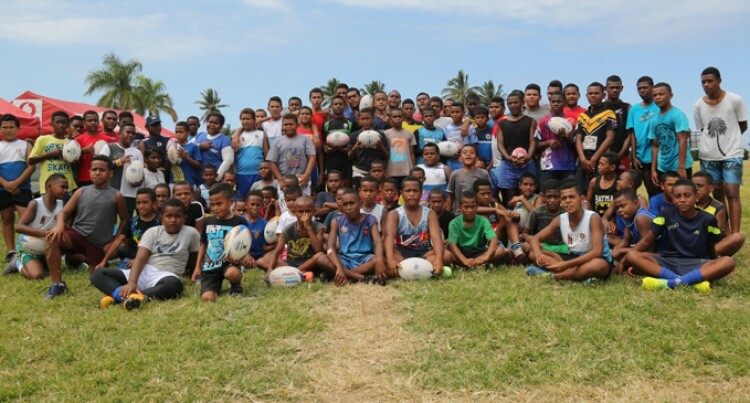 The FRU development officers and former Fiji Airways Flying Fijians were at the two-day clinic to teach and encourage children who want to play the sport. FRU development manager and former Flying Fijians skipper Sale Sorovaki said this is one of their main initiatives in developing rugby right from grass root level. “This is for the kid as they are in their second week of holidays and for them to have fun and enjoy before they resume school next week. Sorovaki added that the clinic was done for the participants to have a fair idea of what needs to be done during play. “For the two days we have been teaching them the basics skill like catching and passing and identifying individual skills like kicking. “We’ve got the youngest participant who is three-years-old and the eldest who is 17 and all that we are doing is teaching them the simple skill which is passing and catching. A few of the participants spoke to SUNsports on why they had attended the coaching clinic. Marist Brothers Primary School’s George Koroinasau said he wants to be a Flying Fijian in the future. “I wish to be the first one in our family to be a Fiji rep that will represent the country,” the Year 7 student said. The Nadelei native from Ba said the clinic would prepare him well for upcoming tour to Tonga. “I’m part of the under-13 Fijian squad that will be going to Tonga during the eight weeks holiday. I’ve continued on my training by being at the clinic and will give my best shot in Tonga. But 13-year-old said his dream is to play for the Fiji Airways Flying Fijians. For Veiuto Primary School’s Year 5 student Malakai Rabolabiu is excited that the clinic has helped him to become a better player. “I also want to play for Fiji,” the 11-year-old said. Rabolabiu said being part of the clinic has helped him to improve on his skills and has taken him to another level. Rabolabiu added that he looks forward in taking up the sport in the future. “I like to attend Ratu Kadavulevu School when I grow up so that I can represent them during the Deans competition and also get a scholarship abroad. “Apart from all rugby players in the Fiji sevens team I look up to Alasio Naduva because I like the way he plays and the way he interacts with people. His school-mate Vilivo Whippy wants to become the next Eroni Sau in the future. The Kadavu, Galoa native said he is looking forward to the day he will make his name in the sport. “Taking part in the clinic has pushed me to lift my level of preparation towards next year’s Kaji rugby. Whippy added his next aim is to play in the Deans Trophy.